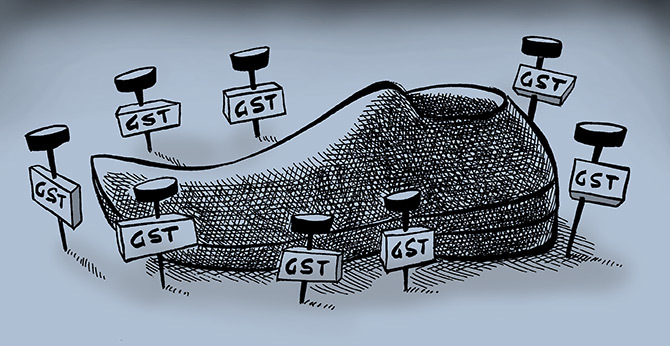 The anti-profiteering authority has so far got 169 complaints alleging that suppliers of goods or services have not passed on GST benefits to customers. Anxious over the government's anti-profiteering drive under the Goods and Services Tax regime, companies in the segments of fast-moving consumer goods (FMCG) and information technology (IT) software are planning to petition the high courts in Delhi and Mumbai, seeking more clarity on the clause. While the government has not yet prescribed rules or guidelines to compute profiteering, it has sent notices to some companies, including Hardcastle Restaurants, Lifestyle, and Pyramid Infratech. “There is a lot of ambiguity in the anti-profiteering clause," said a representative of an FMCG company, who did not wish to be identified. He said product prices were not based on taxes alone but on supply and demand conditions, supplier cost, and other factors. The companies planning to move the HCs have not received an anti-profiteering notice but are filing petitions in anticipation. Another company in the FMCG sector said a change in profits between the pre- and post-GST regime would also be based on factors like lower logistics cost and seamless movements of goods across the country. An IT company representative said its clients were questioning it for not passing on GST benefits. “The issue is, how to compute these benefits?” he asked. It will take 10-15 days to file the writ petition. “If the government comes out with rules before that, we will not file it,” he added. “The absence of a prescriptive methodology to determine profiteering is making it difficult for taxpayers to determine the quantum of benefits required to be passed on, if any. "In several cases, customers have been insisting on the benefits being passed on, leading to an increasing need for a standardised methodology,” said M S Mani, partner at consultancy Deloitte India. The Director General of Safeguards, the investigative arm of the Department of Revenue, has sent notices to Pyramid Infratech, Honda Motor Vehicles, Lifestyle International, and Hardcastle Restaurants (master franchisee of McDonald’s) on this ground. It has asked these companies to provide their balance sheets, trial balance, and profit-and- loss accounts for the past year. The Confederation of Indian Industry (CII) has also pressed for clear guidelines on anti-profiteering, saying the issue could lead to hardship for smaller players. “Another challenge is complicated compliance. The government would need to compare the cost of every product before and after the GST to determine the amount of tax benefit applicable. "Manufacturers or suppliers might also deal in several products that are not distinguished in their accounting books; determining the price margins for individual products will be difficult,” said the CII. "Tax authorities will need to be sensitive to natural business outcomes and avoid undue harassment. Also, the clause gives relatively less time for preparation and adoption of the new provisions." The anti-profiteering mechanism is a three-stage process. There is a state-level screening committee for local complaints and a standing committee for national-level complaints; then, investigation by the Directorate General of Safeguards, and then a probe by the decision-making body, the National Anti-Profiteering Authority. Meanwhile, the government is looking at simplifying the anti-profiteering application complaint form to facilitate complaints from citizens.